When we're not in the kitchen, we are hanging out in the living room. It is about 16x16 and seems huge compared to our last house. 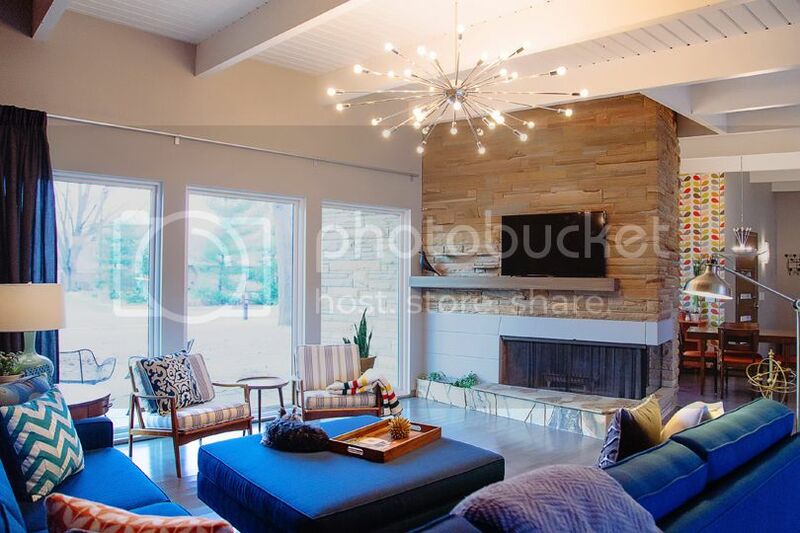 With two walls of glass, a uniquely stacked brick wall, and a partial fireplace wall, I admit I was stumped with furniture placement for a long time. 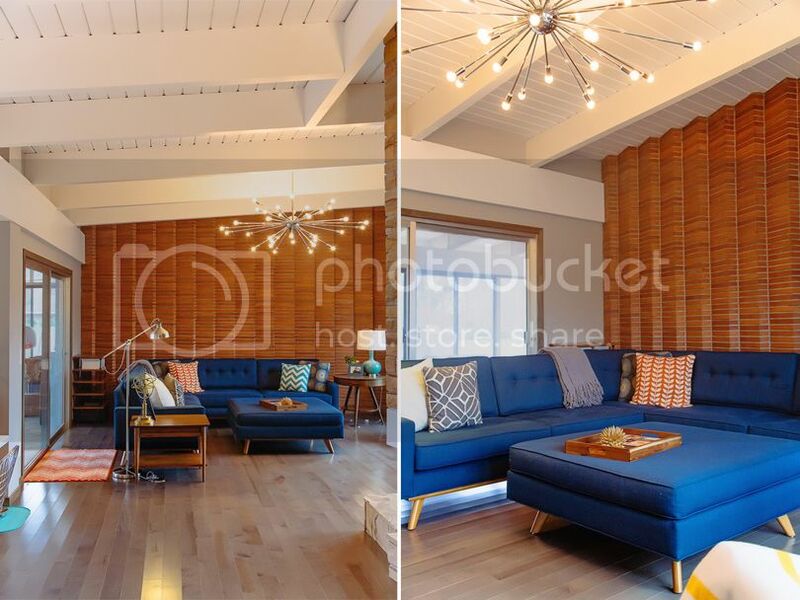 I started searching for a vintage sofa, or ideally, a pair of matching sofas that could face each other in the middle of the room. When my searching came up null, I decided to go "new" and went directly to Thrive Furniture to see if they had anything I loved. 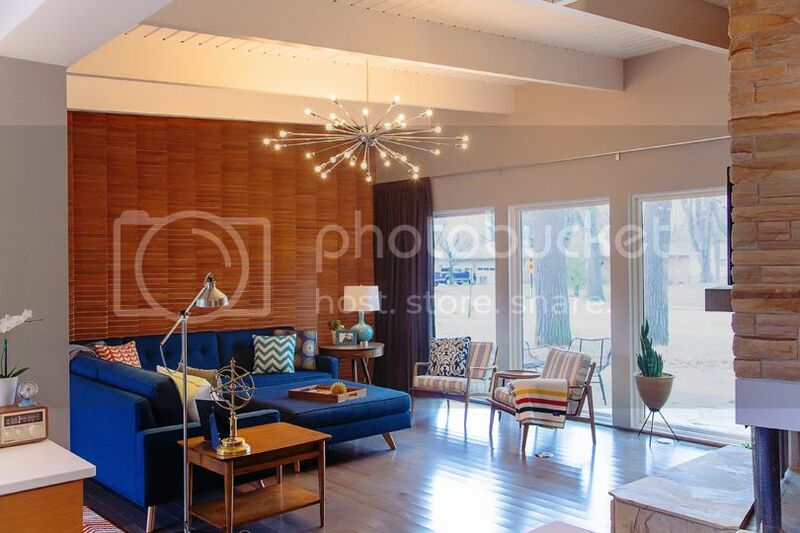 Their fabric samples came quickly, and I placed an order for their Taylor L Shape Sectional in Azure on Black Friday, 2012 - almost a full year before we actually moved it to the current spot and started using it! It's comfy, the fabric seems to be holding up well so far, and the color is perfect with our orange-y brick wall. We LOVE it! The large windows here are 4' wide and look out into our front yard. I had a hard time committing to window treatments, but in the beginning of December, Greg finally hung the KVARTAL system from IKEA that works well for this large wall of windows. Initially, we weren't sure where to put the television. Homes in the 1950's weren't set up for a large TV - heck, many didn't have them at all! We didn't want to stare at the brick wall when the television was off, and we certainly did not want to plop it in front of the windows or slider, so we ended up adding a floating mantle, which was stained to match the floors, to hide the cords for our television. I really love that our sofa faces the fireplace and the front of the house. This lamp was a TJ Maxx find ages ago, and we used it in our old house. I picked up the frame at Marshall's in Palm Springs last year for $5, and the plants have been with us for a long time. The side table was an estate sale find for $20 from a friend's husband's grandma; it's perfect in here! The two side chairs actually belong in our three season porch, and right now, we have a new chair in here (that was at the upholstery shop when photos were taken) that we scored on Craig's List. 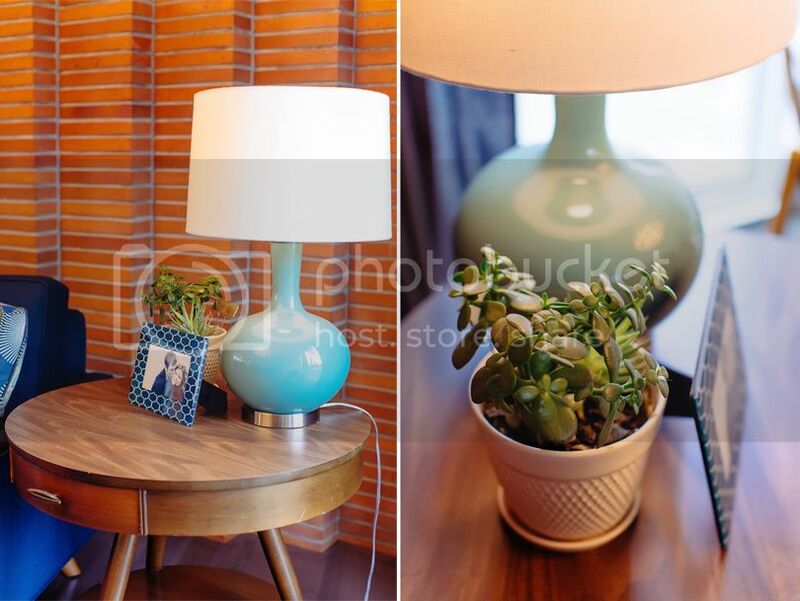 The bullet planter is vintage, as is the mini round side table. The Pendleton blanket was an outlet find by my mom, and gifted to me for Christmas years ago. It fits right into this house full of colors and is quite the classic addition to this room. Olive, our eight year old Yorkie, sits on the ottoman starting out the front windows most days. I LOVE this image of her captured by K. Holly! The tray, along with the gold urchin, are both from Target in the past year. I believe both were on clearance when I finally picked them up. Another vintage side table, a gold orb, and a family photo grace the other side of the sectional sofa. And while we bought the home with a ceiling fan in this room, that was the first thing to go! 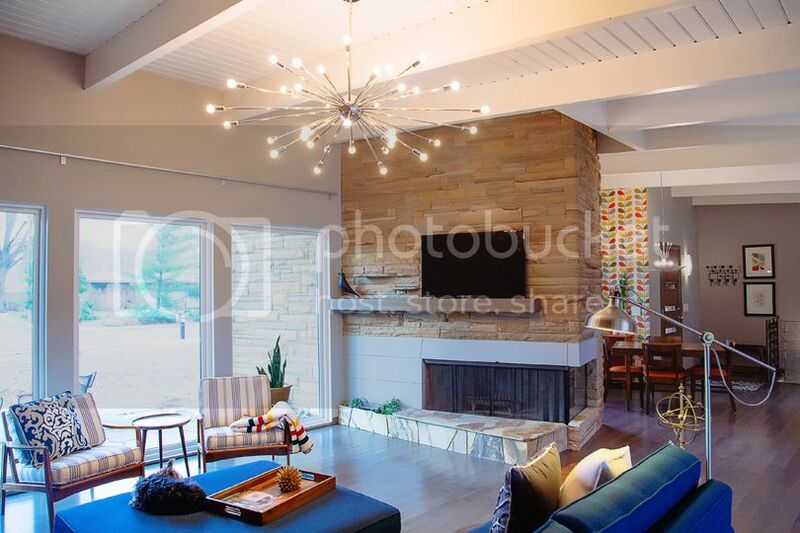 The amazing Sputnik light fixture is from Practical Props in Los Angeles. It is 60" wide, and it took Greg three+ hours to assemble it last summer! Throw Pillows | Various places: Pottery Barn, HomeGoods, Target, etc.